Could you imagine Buffalo without the Buffalo Bills? 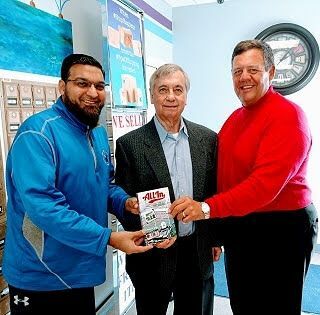 Ron Zoeller, the author of the new book, All In, is truly an amazing individual. He is responsible for keeping the Buffalo Bills in Buffalo, and talks about this story in his book. The 360-page book contains more than 120 photos and inspirational quotes from business, military and sports leaders. In 1998, he was the Vice-Chairman of Business Backs The Bills. Ron was a front-runner calling for community action to prevent the Bills from leaving Western New York. His new HMO had purchased the naming rights for Buffalo’s downtown baseball stadium when it was called North AmeriCare Park and in two decades he built that company from launch to revenues of $50,000,000 and hundreds of area employees. Mike Billoni, an Island resident, has published the book and has been kind enough to use the Island Ship Center for all the initial pre-printing of manuscripts and copies. I was honored and grateful to work with both Mike & Ron on getting this project off the ground and now, as a celebration, we’re hosting a book signing next week, on Saturday, March 10th, from 10 am to 1 pm at our awesome neighbor’s bakery, Momma De’s Mixing Bowl. $5 of every book purchased will go to benefit the DECA (business and marketing) club at Grand Island High School. So, please make sure to stop by, meet Ron and Mike, and be sure to pick up signed copies of the book, which makes an awesome gift for anyone connected to WNY and the Bills. The book talks about how Ron and his father purchased what is now the Riverstone Grill on East River Road on Dec. 4, 1980 and operated Z’s Island Inn for three years. It was Von’s Inn when they bought it from Jean Von Wryeza for $1,000 down on a $98,000 purchase with a 10-year mortgage. The book publisher and critical editor is Michael J. Billoni, Managing Partner of Billoni Associates Publishing. The fulfillment of the mail order & eCommerce sales is being handled by Island Ship Center. We look forward to seeing you there and thank you again for your trust!